In the 1980s, Chertoff was assistant to Rudolph Giuliani, then the U.S. attorney for the Southern District of New York. Giuliani was prosecuting leaders of La Cosa Nostra (an organized crime syndicate), but he decided to head up another case and gave the mobsters to Chertoff. The assistant prosecutor got convictions for all the Mafia bosses and Chertoff's star began to rise. As the top U.S. prosecutor in New Jersey he went after the infamous electronics tycoon "Crazy Eddie" Antar who was convicted of racketeering and securities fraud. Chertoff also put Jersey City Mayor Gerald McCann in federal prison for defrauding investors through a savings-and-loan scam. After a stint in private law practice, Chertoff became assistant attorney general for the U.S. Department of Justice's Criminal Division where he led the investigation of Enron and its accounting firm, Arthur Andersen. 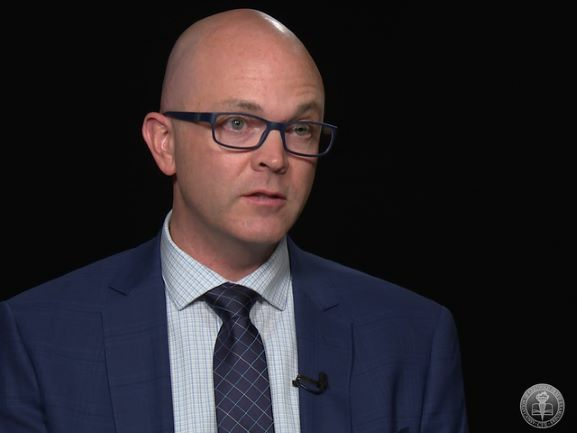 He was the senior Justice Department official on duty at the FBI command center right after the attacks on the World Trade Center and the Pentagon. Chertoff co-authored the USA PATRIOT Act, which was signed into law shortly after the attacks. He was serving as the U.S. circuit judge for the Third Circuit Court of Appeals when he was named head of DHS. Despite his varied career as a government administrator, Chertoff's heart remained in the courtroom. "When I graduated from law school, I had no clear vision about what kind of law I wanted to practice," he recently said. "But I did know I wanted to be in the courtroom." With the advent of the new presidential administration, Chertoff has retired from his Homeland Security post, but he now has time to offer counsel from lessons he's learned from his varied career. He will be a keynote speaker at the 20th Annual ACFE Fraud Conference and Exhibition July 12-17 at the Bellagio in Las Vegas, Nev. Your career seems to have revolved around the rule of law and justice issues whether as a federal prosecutor, a circuit judge, an assistant attorney general, or the DHS secretary. What originally drew you to the law, and did you have a career path when you graduated from Harvard Law School? When I graduated from law school, I had no clear vision about what kind of law I wanted to practice, but I did know I wanted to be in the courtroom. Fortunately, some of my early mentors like Judge Murray Gurfein of the U. S. Court of Appeals encouraged me to consider a position as a federal prosecutor. I found that this appealed not only to my interest in courtroom experience but, more deeply, to my desire for public service. Throughout your career, you investigated and prosecuted fraud cases. As a partner in a law firm you were national chair of its white-collar criminal practice. You're known for prosecuting mobster cases and the Crazy Eddie case. But can you talk about some of the other lesser-known cases that intrigued you and were unique learning experiences? Every fraud case is a learning experience. As a young prosecutor, I investigated and prosecuted embezzlements, tax frauds, and other crimes. One early case involved the chairman of the Board of Supervisors of Sullivan County in New York State. As the top elected official in the county, he fraudulently expended federal grant moneys for his own benefit. In another case, the mayor of Jersey City was convicted of siphoning thousands of dollars from bank investors for his own use. These cases vividly teach that auditors and examiners need to pay special attention to those who hold positions of trust and power because they have often have the ability to override the normal controls that are in place. What is your philosophy on the correlation between organizational fraud and the threat to U.S. national security? While most fraud is not a national security issue, terrorist and other security threats not infrequently involve fraud. Document fraud is almost always essential to terrorists, because they need false identification to cross borders or enter secure areas. Money laundering is critical for those engaged in terrorist finance. And some terrorist groups use fraud and crime as financing mechanisms. For example, several years ago the government convicted a 28-year-old man for materially supporting terrorism by funneling the proceeds of a multi-million dollar cigarette smuggling scheme to Hezbollah. What are some of the latest fraud schemes - money laundering or otherwise - that would-be terrorists and possible front groups are using? As I mentioned, cigarette smuggling and other schemes have been fruitful sources of income for terrorist groups. Similarly, terrorist groups typically launder money to disguise their sources of funding. As the Treasury Department has cracked down on terrorist finance, more terrorists are moving outside the banking system, using informal money exchanges or cash couriers. 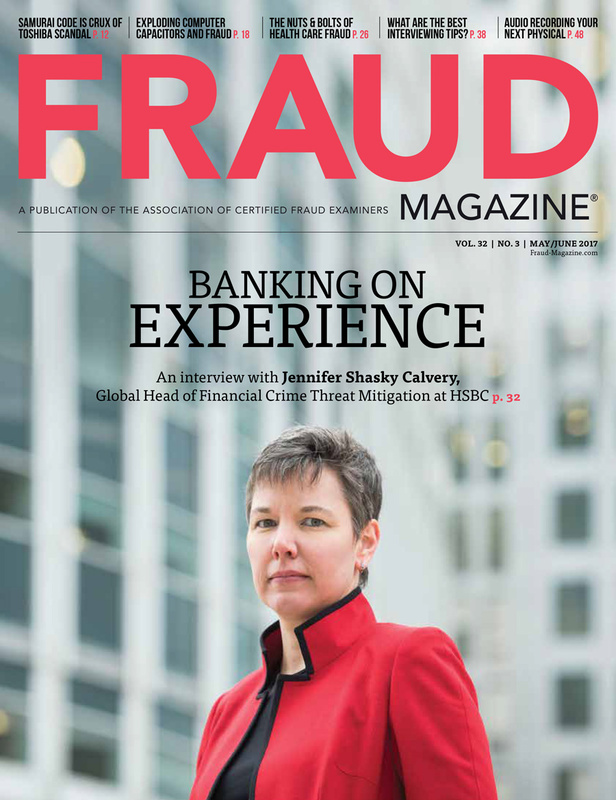 What kind of advice can you give our ACFE members about the global aspects of fraud and white-collar crime? Globalization has dramatically increased the risk of fraud and similar crimes. 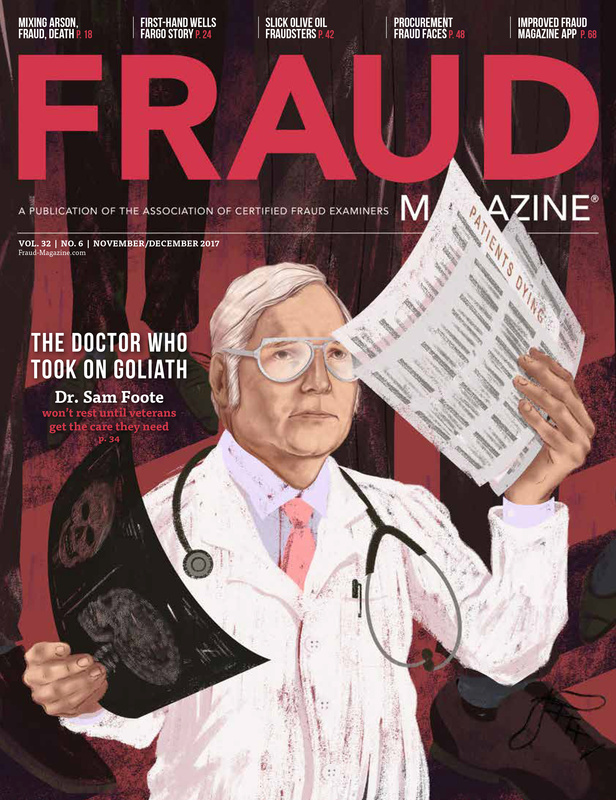 The lack of a single comprehensive regulatory authority makes it much harder for investigators to gain access to fraud perpetrators. Differing legal rules increase the difficulty of policing misconduct across national boundaries. Further, in those parts of the world where corruption is prevalent, or where much of the financial activity takes place outside established financial channels, tracing money is extraordinarily difficult. That places a special burden on multinational corporations to maintain rigorous controls over their internationally distributed activities. According to an article in the Harvard Law Bulletin, law-thriller novelist Scott Turow, one of your Harvard Law School classmates, said you were never "reluctant to debate with anybody" and that you were "self-confident, assertive, but never obnoxious." Supposedly, he adapted many of your law-school exchanges for his first book, "One L," a semi-fictional account of life as a first-year student at Harvard Law. How have your persuasive skills aided you in investigating and prosecuting fraudsters? My approach has been to begin every investigation with a picture of the case that you might eventually prosecute. That means that the collection of evidence and the interviewing of witnesses must progress as if you are filling in the blanks in a closing argument. Of course, as facts develop the eventual picture may change. But the key is to engage in the process of assembling the proof with a clear vision of how the pieces will fit into the final narrative of the fraud. If the investigation is successful, you will have all the pieces of evidence to support the summation at the end of a trial. The persuasiveness lies not in the rhetoric but in the disciplined marshaling of facts that speak for themselves. 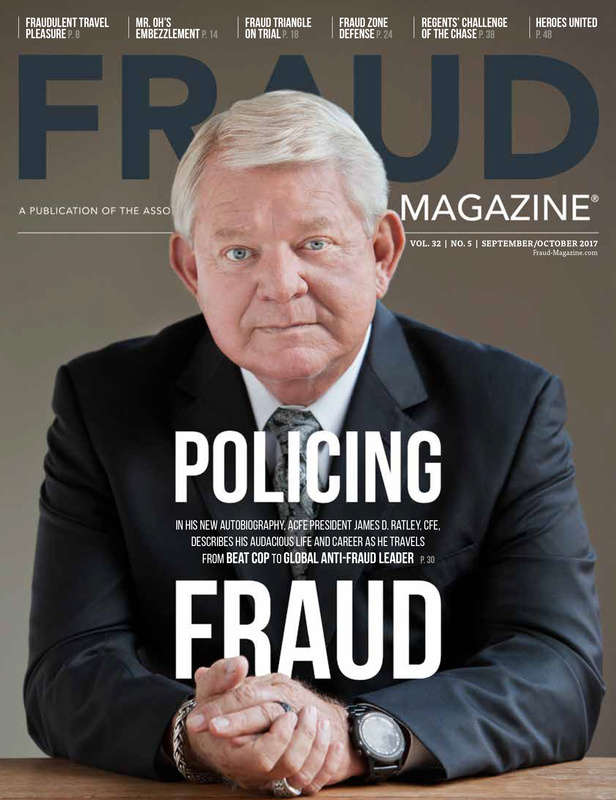 Joseph T. Wells, CFE, CPA, founder and Chairman of the ACFE, has always supported the promotion of anti-fraud training in higher education. What can you say to encourage budding fraud examiners either still in college or just beginning their careers? Bluntly, fraud examiners, auditors, and fraud prevention specialists will never find themselves running out of business. To the contrary, as more and more financial transactions occur electronically, opportunities for criminal enrichment will flourish in the areas of financial manipulation and fraud, rather than traditional criminal fields like robbery. That's why, during the 1990s, organized crime increasingly turned its focus from loan sharking and other traditional mob activities to stock fraud and credit card fraud. For example, when I was secretary of Homeland Security, I announced that the Secret Service had busted the largest identity theft in history - more than 40 million credit card numbers stolen and millions of dollars fraudulently obtained. What general - or specific - advice would you have for our ACFE members as they tackle fraud cases in the public and private sectors? 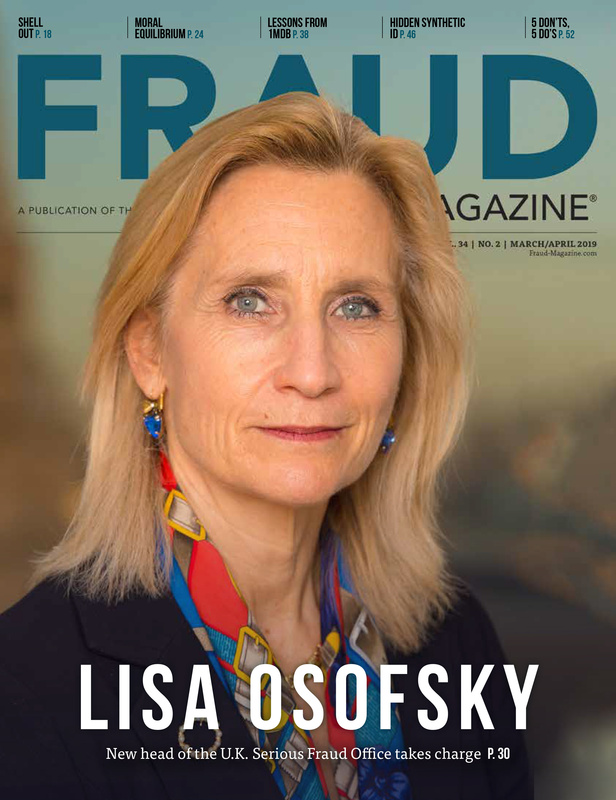 As fraud - and fraud prevention - become global, the ability to validate and certify the professional credentials of those who combat fraud becomes more important. That way, businesses around the world have the assurance that those they employ to defeat fraud meet appropriate standards of skill and integrity. I know that the ACFE has chapters around the world including China and the Middle East. Because many national economies have relatively immature auditing sectors, I would encourage the ACFE to enhance its international outreach. Recent events like the major financial Satyam fraud uncovered in India provide opportunities to expand your reach. The recession is beginning to reveal frauds (such as the Madoff Ponzi scheme) and undoubtedly will cause other fraud problems. 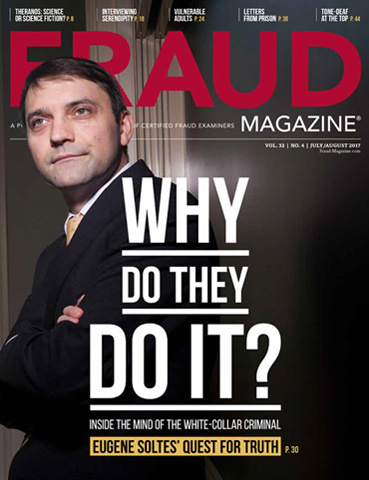 What are your thoughts on the relationship between troubling economic times and fraud? Have you seen a correlation in past recessions? Troubled economies generally reveal frauds in two ways. First, fraudulent Ponzi-type schemes that were concealed during a rising tide of economic prosperity suddenly emerge when the tide begins to ebb. We saw this most recently and tragically in the alleged $50 billion Madoff scandal. Second, companies dealing with earnings shrinkage are sometimes tempted to "paper over" bad financial news with short-term fraud. We saw this during the dot-com bust and in the Enron case. What do you think that CFEs can contribute during this severe international economic downturn? The global financial crisis is, at its bottom, a crisis of trust. Whether there are questions about the value of assets or anxiety about other Madoffs in the wings, economic activity will not energize until people are convinced that they can invest or transact business with confidence. By establishing a recognized standard for fraud prevention and detection, CFEs provide the assurance to the market that's a condition of returning to normalcy. At a time when accountants and rating agencies have sometimes failed to live up to their professional standards, the training and values embodied by credentialing will have increasing importance. As the head of the Justice Department's Criminal Division, you led the investigation of Enron and its accounting firm, Arthur Andersen. You moved to indict Andersen instead of accepting its offer to negotiate a settlement, obviously a difficult choice. What made you decide to go in that direction? Actually, Arthur Andersen was offered the opportunity to have a settlement: a monitorship with an admission of wrongdoing. But Arthur Andersen did not want to acknowledge wrongdoing in its destruction of documents relating to the Enron case. To have failed to hold them accountable would have sent the message that large firms are held to a different standard of compliance because they are too big to fail. The lesson must be that no entity is too big or too important to take responsibility for criminal wrongdoing. You were a co-author of the USA PATRIOT Act. 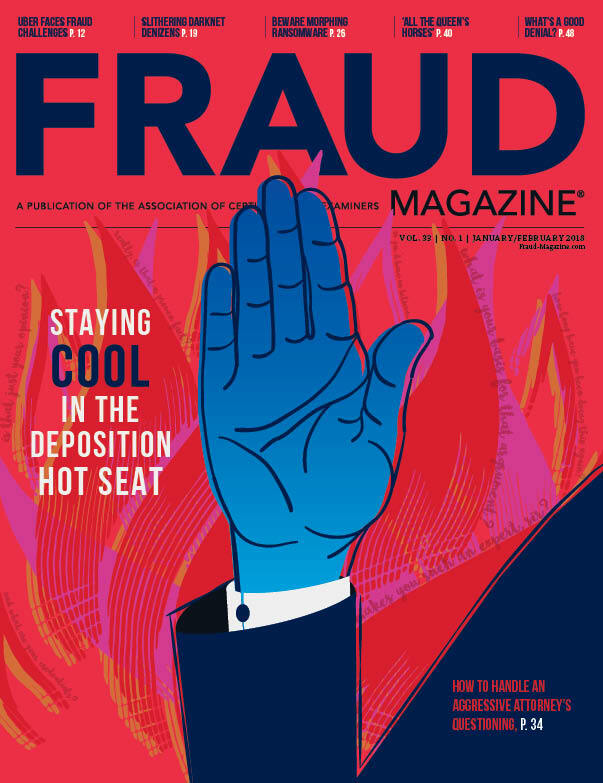 What anti-fraud tenets did you keep in mind when you wrote the Act? Although the USA PATRIOT Act was focused on terrorism, the anti-money laundering provisions reflect a long-standing concern that the opaque nature of offshore shell banks and other financial entities posed a real threat of money laundering for financial crimes and other frauds. The anti-money laundering provisions of the Act were designed to give the treasury secretary authority to reach and gain visibility into foreign entities that might be vehicles for money laundering. We understood that the channels of money laundering may be used for a variety of criminal purposes, whether funding terrorism or concealing the proceeds of fraud. Title III of the Act, "International Money Laundering Abatement and Financial Anti-Terrorism Act of 2001" amends portions of the Money Laundering Control Act of 1986 and the Bank Secrecy Act of 1970. Do you think this section of the Act, which was included to strengthen banking rules against money laundering internationally, has made a difference in fraud cases even apart from those connected to terrorism? Do you think this section has improved communication between law enforcement agencies and financial institutions? Among the first applications of the new law were efforts to get information about monetary transactions involving frauds and corruption. The enhanced requirements for vetting customers also raised barriers to corrupt officials who seek to use the banking system to conceal their ill-gotten gains. Soon after the passage of the USA PATRIOT Act, I met with representatives of our leading financial institutions and secured their commitment to work with us to detect and intercept channels of illicit finance. While most of the work under this title was carried out by the Treasury Department, I know that the Act allowed our financial regulators to clamp down on overseas institutions that were allowing flagrant misuse of the international financial system. When you arrived at the DHS, it was still trying to consolidate 22 disparate agencies into one department. The DHS inspector general at the time reported some organizational and management challenges. Can you share some of the fraud-related improvements? Other general improvements? I'm happy to report that we had no significant financial or fraud-related scandals at DHS during my tenure. Consolidating numerous financial and operating systems was not easy, and the job is not complete. Nevertheless, we dramatically reduced our material deficiencies from an audit standpoint and we also elevated our computer security FISMA [Federal Information Security Management ACT] grade from an F - when I first arrived - to better than a B plus. More generally, we developed a unified and integrated joint planning and operational capability, significantly improved morale, built a unified IT structure, created a unified IT back-up system, and developed a career development plan that promotes interagency experience. What must the DHS do in the future to continue to be a viable department? While the foregoing initiatives must be completed, the biggest single additional improvement would be moving DHS to a unified headquarters campus. Happily, I am able to report that in the few weeks before my departure, the National Capital Region planning authorities approved the establishment of a campus at the former site of Saint Elizabeth's Hospital in Southeast Washington. Congress has appropriated money to begin construction, and I believe that within the next few years this major initiative will be completed. What did you enjoy most about your tenure as DHS secretary? The opportunity to work with many of the 218,000-plus employees of DHS. I have joined them on horseback patrol at the Southwest border, crewed with them on a motor lifeboat in 20-foot seas at Cape Disappointment, slept on a cot with our emergency workers during Hurricane Gustav, overnighted on a Coast Guard cutter in the Arctic Circle, and had many other terrific experiences working with DHS personnel. These have been rewarding experiences. In the end, the most important has been working with them to keep our country safe. On Feb. 15, 2005, Michael Chertoff was unanimously confirmed by the U.S. Senate and sworn in as the second secretary of the Department of Homeland Security (DHS). He formerly served as U.S. circuit judge for the Third Circuit Court of Appeals. Chertoff stepped down as DHS secretary in January 2009. Previous to his DHS post, Chertoff was confirmed by the Senate in 2001 to serve as assistant attorney general for the Criminal Division at the U.S. Department of Justice. In that position, he oversaw the investigation of the 9/11 terrorist attacks. He also formed the Enron Task Force, which produced more than 20 convictions including those of CEOs Jeffrey Skilling and Ken Lay. Before joining the George W. Bush administration, Chertoff was a partner in the law firm of Latham & Watkins. From 1995 to 1996, he served as special counsel for the U.S. Senate Whitewater Committee. Prior to that, Chertoff spent more than a decade as a federal prosecutor, including service as U.S. attorney for the District of New Jersey, first assistant U.S. attorney for the District of New Jersey, and assistant U.S. attorney for the Southern District of New York. As a federal prosecutor, Chertoff investigated and personally prosecuted cases of political corruption, organized crime, and corporate fraud.